Remember your last trip? Did you get your tickets directly from the ticket office? I doubt it. In today’s fast-paced world, finding time to travel to a ticket office and get your tickets is a luxury few can afford. Besides, why bother if you can get your tickets in just a couple of clicks via your laptop or even your smartphone? Indeed, digital travel sales grew rapidly over the last several years, totaling $564.87 billion in 2016. And the number is expected to reach $817.54 billion by 2020. Such explosive growth is fueled by recent technology advances, not the least of which is data science. We at AltexSoft are no strangers to successfully applying data science and machine learning technologies to the field of custom travel software development. So, if you are searching for some fresh ideas on how to put your data to good use, here are 12 application scenarios for machine learning and data analytics in the travel industry. Possibly the most mainstream use case for data science, some recommendation solution is currently incorporated in 99% of all successful products. Similar to personalized content suggestions on Netflix or the “Featured Recommendations” box on Amazon, online travel booking providers often provide tailored suggestions, based on your recent searches and bookings. For example, when searching on Expedia for flights to London, you will be offered several accommodation options for your trip. Similarly, Booking.com offers alternative destinations you might like for your next trip. These are only two of the ways to use data-powered recommendation engines in the travel industry. Following this pattern, online travel agencies can offer car rental deals, alternative travel dates (see example below) or routes, new travel destinations based on the user’s preferences or even some recommended local attractions. With enough data about typical searches or preferred deals at hand, you can build a powerful recommendation algorithm. It can learn even more from the personal browsing behavior of a certain user to deliver highly tailored and more valuable suggestions. For instance, if 8 out of 10 families book a trip to Disneyland in July, offering a single business traveler such a deal in January makes little sense. But if you show a one-day trip to Las Vegas to such a user instead, the chances for success are quite high. Accordingly, investing in data science consulting might not only have a positive impact on your revenue through upsells, it may also improve user engagement by contributing a personalized, efficient UX. 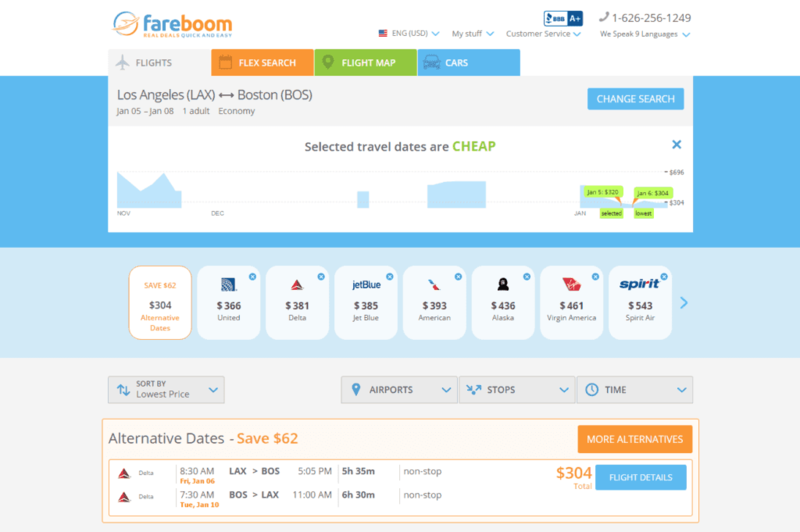 Flight fares and hotel prices are ever-changing and vary greatly depending on the provider. No one has time to track all those changes manually. Thus, smart tools which monitor and send out timely alerts with hot deals are currently in high demand in the travel industry. 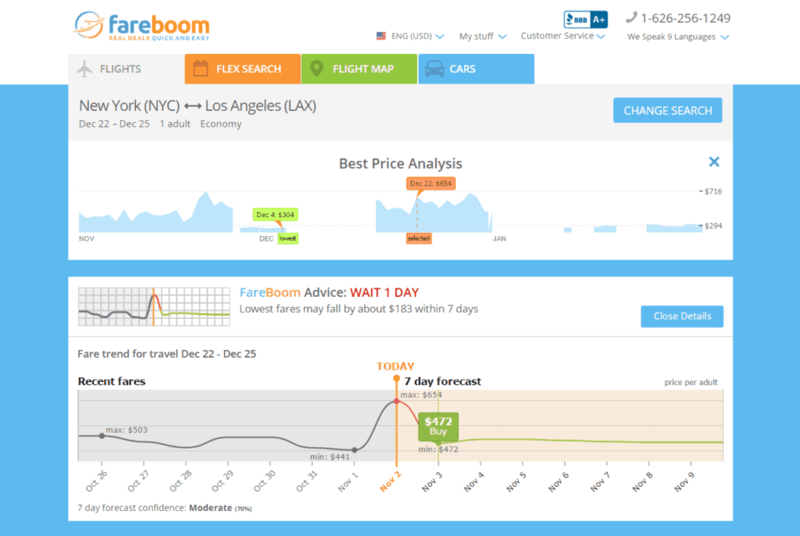 The AltexSoft data science team has built such an innovative fare predictor tool for one of our clients, a global online travel agency, Fareboom.com. Working on its core product, a digital travel booking website, we could access and collect historical data about millions of fare searches going back several years. Armed with such information, we created a self-learning algorithm, capable of predicting the future price movements based on a number of factors, such as seasonal trends, demand growth, airlines special offers, and deals. With the average confidence rate at 75 percent, the tool can make short-term (several days) as well as long-term (a couple of months) forecasts. For example, if during the last several holiday seasons all the prices of flights from San Francisco to Dallas grew significantly a couple of weeks before Christmas, the same tendency might occur this year as well. In this case, the algorithm will say that waiting might be too risky and prompt you to book your flight now. Similarly, if the price for flights to Las Vegas usually drops below average a week before Christmas, you will be offered to wait and book your flight closer to the date. Hopper is another prominent startup, using data science to help people book the cheapest flights using applied predictive analytics. 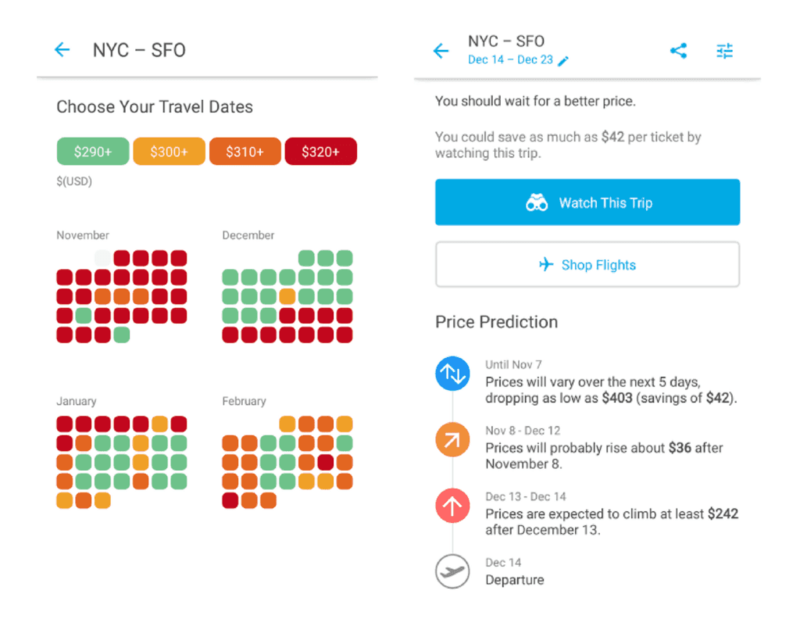 A company that raised total $84.3 million to date, has built an intuitive mobile application for airfare prediction. Named one of the best apps of 2015 by Apple, Buzzfeed, Vogue, Tech Insider, New York Times, and TIME, the tool analyzes billions of data sets daily in order to provide accurate price movement predictions. There is a detailed description of how the system works, which can be found at the company website. Therefore, analytics-based forecast tools, such as mentioned above, have proven to be a valuable addition to an existing travel booking portal or agency website. While being applied to flight booking mostly, such tools could be used in other niche areas of the travel and hospitality industry. 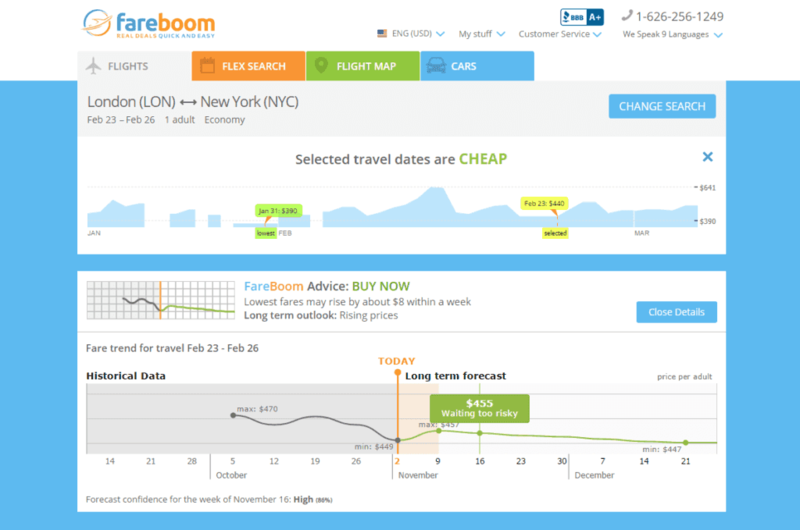 They can be used to predict the changes in hotel pricing, tell you how soon all the rooms in a certain hotel will be booked or even suggest alternative itineraries for your trips according to the weather forecasts or projected airport load on a given day, to help users not only save money, but make traveling more efficient and enjoyable. As convenience is the king in today’s world, smart concierge services, powered by artificial intelligence (AI) are gaining momentum in various industries. Travel booking is only one of the areas being heavily automated by algorithms. Intelligent programs, trained to perform a certain task on a user’s request are usually referred to as “bots” or “chatbots.” With the top four chat apps having over 4 millions of monthly active users just for April 2018, instant messaging platforms are widely adopted by some prominent brands as a great way to reach out to the clients and build better customer relations. For example, Hyatt, a global hospitality leader, has been using social platforms to connect with its customers since 2009. Recently, the company expanded its customer support toolset with Facebook Messenger. Yet such 24/7 mobile support requires significant resources, both human and financial. This is where AI-powered virtual assistants come in handy. Most often integrating with popular instant messaging apps, such as Facebook Messenger, Slack, Telegram or Skype, virtual travel assistants are trained to perform various tasks. From searching for the cheapest deals, booking flights and making hotel reservations, to planning whole trips and enhancing your overall travel experience through useful information and valuable suggestions about popular tourist destinations, places to eat or local attractions — these are the most popular ways to use AI bots. 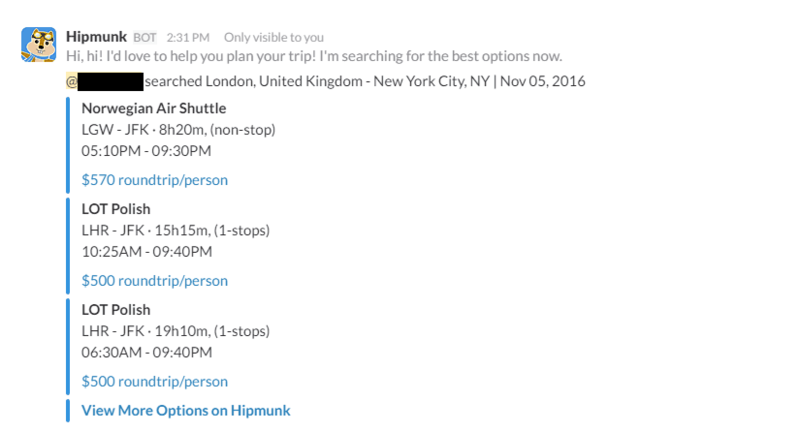 By simply typing “/hipmunk I need to get from London to New York on November 5” on Slack, you can get the most up-to-date flight options, including prices. 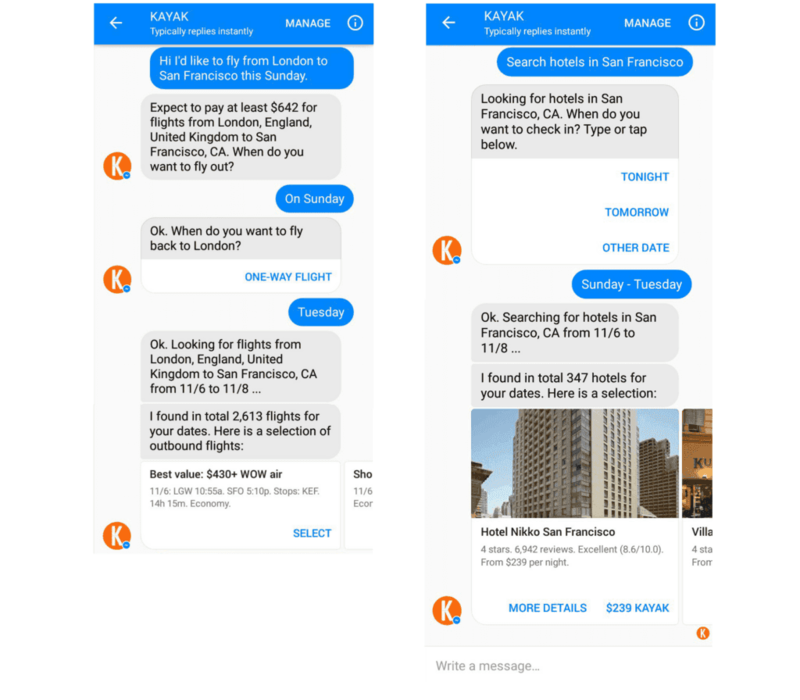 Kayak, another popular travel booking service allows you to plan your next trip directly from your Facebook Messenger app. This chatbot is also more human-like. It doesn’t need special commands, understands simple questions and responds in a casual, conversational style. What’s the baggage allowance for my flight? Where is the nearest business lounge? What’s my boarding gate number? While chatbots have yet to reach mass adoption among travelers, intelligent assistants become increasingly popular when combined with voice-activated devices. The estimated number of Amazon Echo owners is about 8.2 million people as of July 2017. Powered by Amazon Alexa, an intelligent assistant, the Echo device provides a fully voice-activated interface. Similar products are available from Google, powered by Google Assistant, and Apple, powered by Siri. Amazon and Apple already provide open development kits to integrate voice assistants with third-party services. For instance, Amazon’s Alexa has about 15,000 so-called skills, integrated services. One of them is built by Kayak mentioned above. Once users enable the Kayak skill on Alexa, they can track flights in real-time, explore travel options, and book hotel rooms. The best known smart assistants already have enough audience and integrating with them is the shortest path to reaching travelers that are used to voice-activated interfaces. While the previous case is focused mostly on planning trips and helping users navigate most common issues while traveling, automated disruption management is somewhat different. It aims at resolving actual problems a traveler might face on his/her way to a destination point. Mostly applied to business and corporate travel, disruption management is always a time-sensitive task, requiring instant response. While the chances to get impacted by a storm or a volcano eruption are very small, the risk of a travel disruption is still quite high: there are thousands of delays and several hundreds of canceled flights every day. Regardless of the reasons, being stranded somewhere in Europe late at night when you need to be in Tokyo by noon tomorrow can cause huge inconveniences. Moreover, in business travel, this might result in significant losses and have serious implications for your company. With the recent advances in technology, it became possible to predict such disruptions and efficiently mitigate the loss for both the traveler and the carrier. The 4site tool, built by Cornerstone Information Systems, aims at enhancing the efficiency of enterprise travel. The product caters to travelers, travel management companies, and enterprise clients, providing a unique set of features for real-time travel disruption management. The opportunity for data science here lies in predicting travel disruptions based on available information about weather, current delays, and other airport service data. Thus, an algorithm trained to monitor this data can send out timely notifications, alerting the users and their travel managers about upcoming disruptions, and automatically put a contingency plan into action. For example, if there is a heavy snowfall at your destination point and all flights are redirected to another airport, a smart assistant can check for available hotels there or book a transfer from your actual place of arrival to your initial destination. Not only passengers are affected by travel disruptions; airlines bear significant losses every time a flight is canceled or delayed. Thus, Amadeus, one of the leading global distribution systems (GDS), has introduced Schedule Recovery system, aiming to help airlines mitigate the risks of travel disruption. A data science-powered recommendation engine, the tool helps airlines instantly address and efficiently handle any threats and disruptions in their operations. The system underwent a serious test in 2016. During heavy storms that caused delays across Australia’s east coast, just 15 out of 436 Qantas flights (about 3.4 percent) were canceled, as compared to 70 out of 320 (22 percent) flights by Virgin Australia, which uses the old manual system to manage disruption. The company’s on-time performance also remained high: 86 percent on Saturday and 62 percent on Sunday, while Virgin’s performance was at 74 and 48 percent respectively. The described opportunities are a great example of how data can add value, reduce cost and improve efficiency of travel disruption management. Being a new and unsaturated market, it offers relatively low barriers to entry. Not unlike personal travel assistants and intelligent disruption management, airlines can utilize the power of artificial intelligence to streamline the customer support process. Especially now, when almost half of all consumers agree that the speed of response to an inquiry is the most important component of successful customer service. 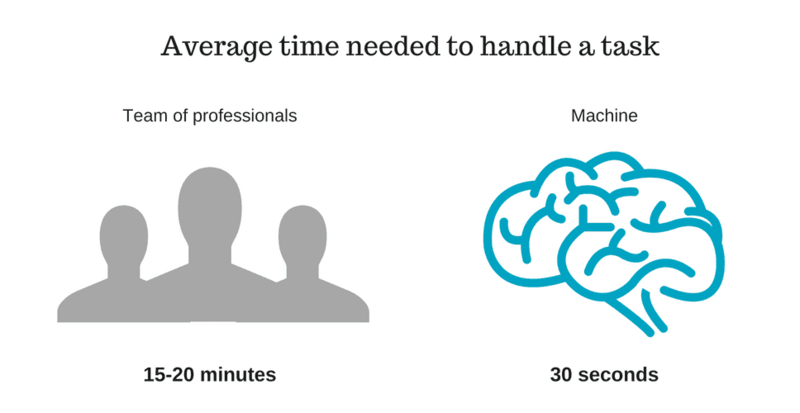 Based on the experiment conducted by Qantas to test the efficiency of their travel disruption system, what takes an experienced professional about 15-20 minutes can be done by an algorithm in under one minute. That said, Gartner predicts that 25 percent of customer service and support operations will rely on the virtual assistant technology by 2018. Combining virtual assistants with human ones, not only can help you grow your brand loyalty, but also optimize your business performance. For example, if a passenger’s luggage is lost, reporting the loss or even conducting an automated search through a virtual assistant might significantly speed up the process of finding it. This approach eliminates the bureaucracy and paperwork, which is a great way to rehabilitate yourself in terms of customer experience. Moreover, offering a free bonus for any inconvenience caused is an even better way to retain your customers. The importance of loyalty programs for the travel and hospitality industry continues to grow. In 2016, the number of loyalty program members for major hotels chains increased by 13.1 percent (an estimated 344 million members). As this number will only increase, travel agencies and hotels already have enough legacy data from loyalty programs to apply the AI-based personalization. The members of loyalty programs, i.e. most valuable customers, are those users that the travel industry players should focus on first to avoid churn. And this is the low-hanging fruit for the machine learning application. Providing tailored offers for new and unregistered users employing behavior-tracking techniques, metadata, and purchase history won’t always work well. You may make some predictions based on general historical data, but the accuracy of these forecasts won’t be that high for newcomers. On the other hand, combining historic and real-time data for recurring buyers is tangibly simpler. OTAs and hotels can make customized suggestions for MVCs. This will reduce the chances of churn and will aid in further development of strong bonds between brands and their loyal customers. Tailoring suggestions for MVCs also delivers up-selling and cross-selling opportunities. 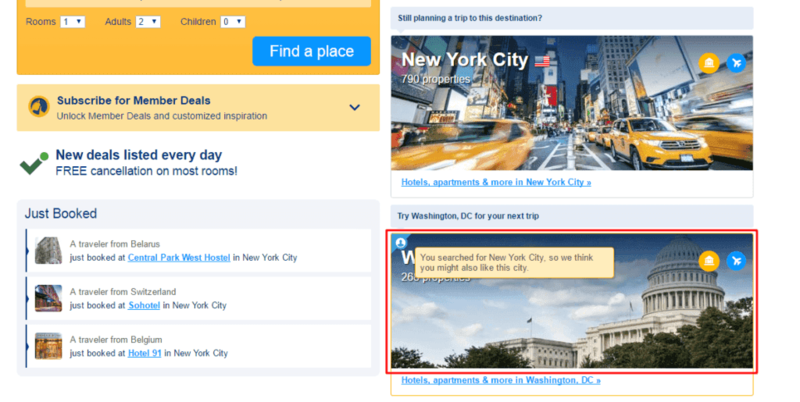 For instance, OTAs can leverage their data to personally suggest hotel rooms or car rental options on top of the flight purchases, given that they use booking APIs from service providers. This can be done within email campaigns or straight from a website. According to the McKinsey 2016 report, travel companies and airlines, in particular, have 23x greater likelihood of customer acquisition, 6x customer retention, and 19x larger likelihood of profitability if they are data-driven. And the use cases of data science in the airline industry abound. While most of them relate to disruption management and delay predictions, some are purely oriented toward UX personalization. United Airlines, for instance, used to have a “collect and analyze” approach to their data. But now they’ve adopted a revamped version of this principle. Since 2014, they have applied “collect, detect, act” methods when working with their landing pages. The company tracks customer behavior, collecting data with more than 150 variables, including individual (e.g. prior purchases and search destinations) and general historic data. This large dataset is used to make detailed customer segmentation and adapt UX in real time depending on the category a particular user belongs to. According to a defined group, the airline website makes 200 milliseconds-long calculations and adjusts on-screen layouts, copy, and other website segments to increase the likelihood of conversion. This dynamic personalization has already increased year-over-year ancillary revenue by about 15 percent, according to United. According to Amadeus, 90 percent of US travelers with a smartphone share their experiences and photos in social media and reviews services. TripAdvisor has 390 million unique visitors and 435 million reviews. Every minute, about 280 traveler reviews are submitted to the site. This is a large pool of valuable data that brands can analyze to improve their services. 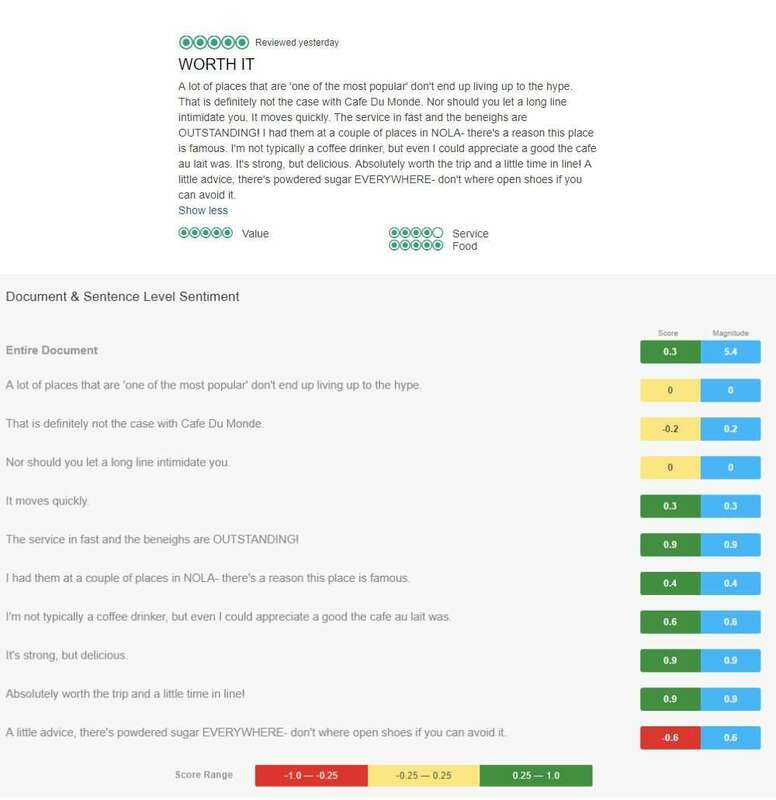 While conventional statistical analysis of reviews subsets is possible, the computing power and underlying machine learning techniques allow for analyzing all brand-related reviews. Sentiment analysis is the branch of supervised learning that aims at exploring textual data to define and rate emotional and factual qualities of it. For instance, Google Cloud Natural Language API is an off-the-shelf application programming interface that can be tweaked and integrated with analytical tools to provide real-time analysis of all brand-related reviews. The maturity of natural language processing and sentiment analysis allows for adopting accurate analytical tools without time-consuming data gathering. The range of applications is large. This may be dynamic tracking of the overall brand image or the ad hoc analysis after product of service updates that cause social media reaction. Dynamic pricing is based on the idea of changing room prices depending on various market circumstances. Such price optimization isn’t anything new for the industry. Hilton and Marriott have been changing their room rates one or two times a day since 2004. As machine learning applications for hotels become common, dynamic pricing can be based on predictive analytics to include more variables in forecasting the best price. We have a whole article on using machine learning for dynamic pricing, so make sure to check it out. In 2015, Starwood Hotels started developing a predictive analytics tool that accounts for hundreds of factors to display the most efficient price for the moment. These include competitive pricing data, weather, a user’s booking pattern, occupancy data, room types, daily rates, and other variables. While the system can work in a fully automatic manner, it also allows human operators to see the data dashboard and manually adjust rates if needed. Dynamic pricing entails the establishment of efficient yield management based on understanding relevant customer and market data. While online travel agencies (OTAs) dominate the room booking sphere, setting data-driven dynamic pricing allows hotels to drive more direct room bookings bypassing intermediaries. Want to share your vision? Take part in engaging conversations on the topic. Disruptions in travel, such as flights cancellation, can offer unexpected opportunities for hotel owners. After the worst winter of 2013, when 500 flights in the US were canceled every day, in March 2014, American hotel chain Red Roof Inn launched an event-based campaign. The hotel used public datasets on flight cancellations and weather information. The data were gathered via an API and processed through a conditional algorithm. With this data, hotel chain predicted canceled flights and targeted their advertising to travelers in areas that were likely to be affected. The brand`s paid mobile search campaign offered potential guests searching for last-minute booking ads with information about rooms and distance from an airport to an inn. The results of the campaign were quite impressive: Red Roof Inn`s number of bookings increased with 266 percent of non-brand mobile bookings, and 60 percent of bookings across non-brand campaigns. Also, the campaign led to waxed conversion rate, which was 375 percent, and 650 percent increase in share-of-voice for key travel search queries. 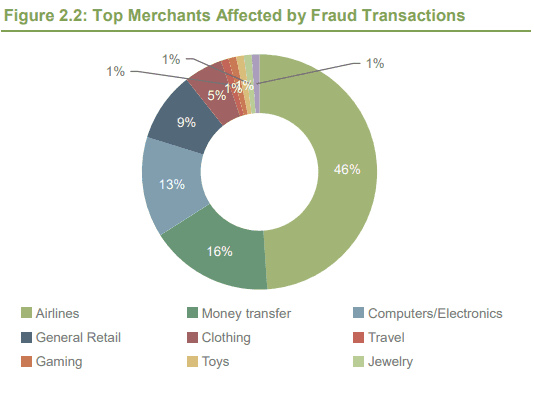 According to Juniper Research report, airlines and travel industries suffer from eCommerce fraud the most. They lose billions of dollars every year having to refund stolen money to customers. Payment fraud is one of the most popular types of scams in this industry that entails using a stolen credit card for booking flights or accommodation. Another popular type of fraud is a friendly fraud, when a customer pays for a purchase, and then claims that the card was stolen, demanding a chargeback. Customer behavior analysis using profiling and machine learning technologies can help prevent and detect illegal transactions from happening. Italian online-booking platform Wanderio cooperated with Pi School that applied an AI-technology of fraud detection. Previously, Wanderio used third-party provider`s service to evaluate transactions. As a result of the use of new technology, the final average cost per transaction improved. AI solutions for fraud detection are suitable not just for online platforms. Mobile booking app HotelTonight also applied customized machine learning model to predict and detect fraud that allowed them to reduce chargebacks to 50 percent. To learn how machine learning tools help to detect fraud, read our whitepaper on fraud detection. AI solutions can assist a traveler not just en route to a destination, but also during a hotel stay. With voice-enabled virtual assistants in rooms, guests can make themselves more comfortable. For example, they can set a temperature in a room, adjust the light, switch TV on and off. With facial recognition, hotels can speed up check-ins, and make stay more secure. Such features of hotel in-stay experience as facial recognition and voice-enabled services are already working in many hotels across the world. More and more hotels use chatbots or even have robot-concierges. Voice-enabled virtual assistants appear in hotels more often. According to the Oracle report Hotel 2025, 78 percent of hotels will upgrade suites with voice-controlled gadgets, and 68 percent of them will use robots for check-in and check-out by 2025. Wynn Las Vegas has equipped all of their rooms with the Amazon Echo speaker, Safeco Field Suits use it not just in rooms, but also to suggest the guests what to do in the city during their stay. Radisson Blu Edwardian Hotel in London uses a chatbot named Edward, and Las Vegas Hotel Cosmopolitan has Rose, another virtual concierge that answers any questions and helps 24/7. Clarion Hotel Amaranten in Stockholm also uses a chatbot that’s based on Alexa. In addition, Amazon plans to launch a customized version of Alexa for the hospitality industry this summer. With the technology of facial recognition, hotel experience becomes much safer. For example, Lemon Tree Hotel in Deli installed a face-recognition system to enhance security. This system captures facial images from CCTV camera and compares them to existing images in the database. And a Japanese Henn na Hotel is entirely run by robots. In Henn na Hotel receptionists are robots, porter is also a robot, and instead of issuing electronic keys, guests have to register their facial images while checking-in. Indeed, in only two years since the report was released, data science is clearly one of the most promising technology fields that is changing the way we travel. The above listed fields of its application are only the tip of the iceberg. With Amadeus alone having a data center with over 37 petabytes of storage, the amount of available travel data is staggering. So, the main question is: Will you be able to turn it to your advantage before your competitors do?